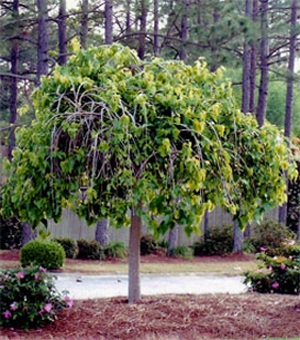 A fast growing, weeping, umbrella shaped tree. Leaves are dark green, alternate, simple, undivided or lobed. 2" to 7" long and up to 6" wide. Adaptable to wide range of pH, from acidic to alkaline. Needs good drainage. Fast growth rate. Males are seedless. Fast growing tree that likes water, heat, and tolerant of any kind of soil.